French Orientalist and writer; born June 23, 1841, at Haguenau, Alsace; died at Paris March 30, 1900. Cahun's family, which came originally from Lorraine, destined him for a military career; but owing to family affairs he was compelled to relinquish this, and he devoted himself to geographical and historical studies. In 1863 he began to publish in the "Revue Française" a series of geographical articles and accounts of his travels in Egypt and the neighboring countries. About the same time he published in the daily press letters of travel, and a geographical review which was the first of its kind. In 1864 Cahun set out to explore Egypt, Nubia, the western coast of the Red Sea, and Asia Minor. Returning to France in 1866, he became a political writer on the staff of "La Liberté"; but when that paper supported the empire, Cahun left it, and joined the staff of "La Réforme" (1869) and "La Loi." During the Franco-Prussian war he was correspondent for several papers. On Sept. 4, 1870, he entered the army as a volunteer, and was appointed sublieutenant of the 46th foot in the following November. When peace was established he resumed his Oriental studies, devoting himself chiefly to researches concerning the Turks and the Tatars. In 1875 he was appointed to the Bibliothèque Mazarine, where he was specially engaged in the compilation of an analytical catalogue from the year 1874. 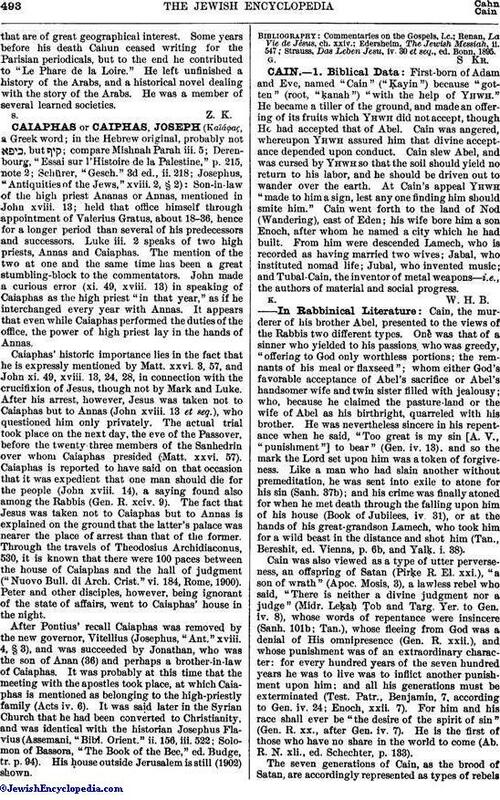 Meanwhile Cahun had begun to publish a series of historical novels dealing with ancient history, in the style of the journeys of Anacharsis in Greece. They are said by one critic to be written in temperate and pure French, combining interest with genuine archeological knowledge. It was Cahun's intention to present facts of ancient history that were not generally known, and thus make contributions to general history and geography. These novels include: "Les Aventures du Capitaine Magon," on Phenician explorations one thousand years before the common era (Paris, Hachette, 1875); "La Bannière Bleue," adventures of a Mussulman, a Christian, and a pagan at the time of the Crusades and the Mongolian conquest (ib. 1876); "Les Pilotes d'Ango," dealing with French history of the sixteenth century (ib. 1878); "Les Mercenaires," of the time of the Punic wars (ib. 1881); "Les Rois de Mer," on the Norman invasions (Chasavay, 1887); "Hassan le Janissaire," on Turkish military life of the sixteenth century (crowned by the French Academy); "La Tueuse," scenes from the Mongol invasion of Hungary in the thirteenth century (1893). 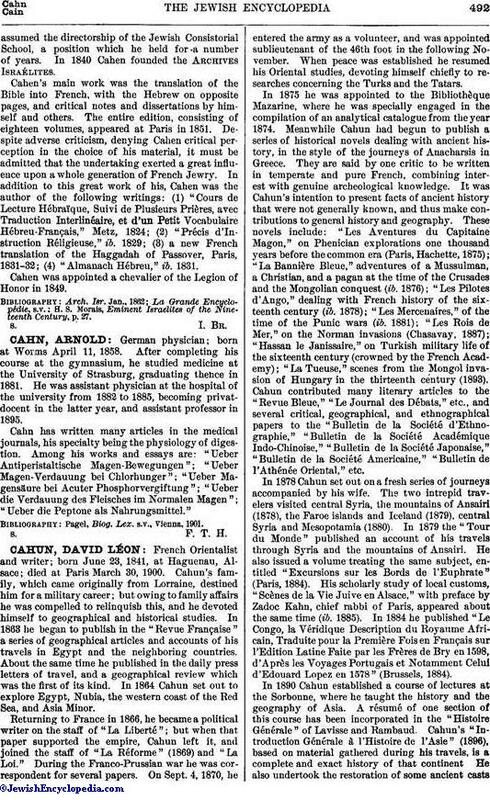 Cahun contributed many literary articles to the "Revue Bleue," "Le Journal des Débats," etc., and several critical, geographical, and ethnographical papers to the "Bulletin de la Société d'Ethnographie," "Bulletin de la Société Académique Indo-Chinoise," "Bulletin de la Société Japonaise," "Bulletin de la Société Americaine," "Bulletin de l'Athénée Oriental," etc. In 1878 Cahun set out on a fresh series of journeys accompanied by his wife. The two intrepid travelers visited central Syria, the mountains of Ansairi (1878), the Faroe islands and Iceland (1879), central Syria and Mesopotamia (1880). In 1879 the "Tour du Monde" published an account of his travels through Syria and the mountains of Ansairi. He also issued a volume treating the same subject, entitled "Excursions sur les Bords de l'Euphrate" (Paris, 1884). His scholarly study of local customs, "Scènes de la Vie Juive en Alsace," with preface by Zadoc Kahn, chief rabbi of Paris, appeared about the same time (ib. 1885). In 1884 he published "Le Congo, la Véridique Description du Royaume Africain, Traduite pour la Première Fois en Français sur l'Edition Latine Faite par les Frères de Bry en 1598, d'Après les Voyages Portugais et Notamment Celui d'Edouard Lopez en 1578" (Brussels, 1884). In 1890 Cahun established a course of lectures at the Sorbonne, where he taught the history and the geography of Asia. A résumé of one section of this course has been incorporated in the "Histoire Générale" of Lavisse and Rambaud. Cahun's "Introduction Générale à l'Histoire de l'Asie" (1896), based on material gathered during his travels, is a complete and exact history of that continent. He also undertook the restoration of some ancient caststhat are of great geographical interest. Some years before his death Cahun ceased writing for the Parisian periodicals, but to the end he contributed to "Le Pharé de la Loire." He left unfinished a history of the Arabs, and a historical novel dealing with the story of the Arabs. He was a member of several learned societies.